Students of all skill levels are encouraged to take this class. 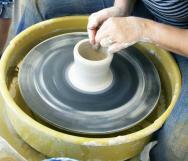 Whether you’ve never used a wheel or you have years of experience you’ll learn how to build and expand your skills and create beautiful functional ceramic forms. For students already comfortable with the basics we will focus on improving your skills and throwing larger and more consistent forms. For those looking to move into large and complex forms the focus will be on learning to control more clay and adjusting your technique appropriately. All students will learn to work with glazes and other decorating methods that will result in lovely, functional pieces of pottery. Each student receives a credit for 1,250 cubic inches of glaze firings per 8-week session (pro-rated for shorter sessions). This credit CANNOT be carried forward from semester into another semester. We will continue to not charge for bisque firings.